Some property investors who got hammered in the real-estate debacle of the early 1990s are again on the ropes. But Harold Brown, 84 years old and one of Boston's more controversial and colorful landlords, says he has learned his lesson. There is evidence of that: He is out doing deals. In one of the largest U.S. apartment acquisitions this year, Mr. Brown has paid about $129.5 million for a suburban Boston apartment complex. A venture led by Mr. Brown bought the 409-unit Dexter Park in Brookline, Mass., paying about $40 million and obtaining a nearly $90 million loan thanks to the willingness of housing giant Freddie Mac to continue financing multifamily deals. Mr. Brown says he jumped at the chance to purchase the property, located near his own Brookline home, after the complex was put up for sale in June by a commingled fund owned by various pension funds and managed by UBS Realty Investors LLC out of Hartford. The fund took ownership of the red-brick complex in a transaction in the late 1980s that valued the property at about $47.7 million, according to person familiar with the earlier deal. Mr. Brown estimates Dexter Park, which is 94%-occupied and gets average monthly rents of about $2,700, would have fetched as much as $150 million two years ago. The property produces a cash flow before debt service of $8.2 million. With annual debt service of about $5 million, that leaves a leveraged return on equity of about 8%. There is potential for an even bigger upside if values reverse their downward course. Boston-area apartment vacancies rose to 6.3% in the third quarter from 6.1% a year earlier, and effective rents declined at the steepest year-over-year pace since Reis Inc. began tracking them in 1980. But Mr. Brown expects a rebound in demand for Boston-area rentals within about three years thanks to rising population and little construction. 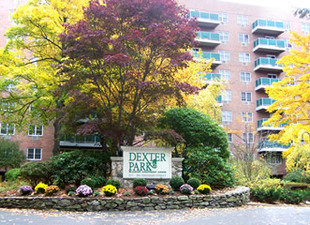 Dexter Park is within walking distance of Boston University, which many of its renters attend. "This is the time to buy because real-estate prices are down," Mr. Brown says. The son of Russian immigrants, Mr. Brown has experienced first-hand the ups and downs of several real-estate business cycles. After graduating from Massachusetts Institute of Technology, he initially worked as an engineer. In 1954 he founded his company, now known as Hamilton Co. Its first acquisition: a six-unit apartment complex in Boston. By the early 1990s, his portfolio contained about 2,000 apartments and 10 million square feet of commercial space. But by his own account he put too much debt on the properties, a factor that led Mr. Brown to file for Chapter 11 bankruptcy protection in 1991 when he listed corporate and personal debt of about $660 million. Along the way he also got tangled up in a city scandal and he pleaded guilty in 1986 to a charge of paying a $1,000 bribe to a Boston city official for a permit. Mr. Brown says he paid a $25,000 fine and did community service working with hospitals to help them get grants. Looking back, Mr. Brown says the bankruptcy reorganization was probably the best thing that ever happened to his company. "It's made us ultraconservative," he says. For example, the company's average ratio of loan to property value is now about 55% compared with nearly 80% before the last real-estate bust, according to Carl Valeri, president of Mr. Brown's company. Additionally, since emerging from bankruptcy protection, Mr. Brown has rebuilt his portfolio. It now contains a higher proportion of apartments and about 2.5 million square feet of commercial real estate, largely neighborhood retail strip centers. Mr. Brown says the lower debt levels have positioned the company better for the current financial crisis because it reduces debt service.